Exxon Mobil Corp. CEO Rex Tillerson. Photo courtesy of C-SPAN. As CEO of Exxon Mobil Corp., Rex Tillerson has been a major player on the world energy stage. Tillerson is meeting with President-elect Donald Trump today and is said to be among the contenders to be his secretary of State. Despite having no government experience, the chief executive along with his oil and gas giant have looked to have their say in U.S. foreign relations, according to an E&E News review of lobbying disclosure records. Those records show Exxon has repeatedly lobbied the State Department. In 2016 alone, Exxon's lobbyists worked on issues including several trade deals, such as the Trans-Pacific Partnership, the Transatlantic Trade and Investment Partnership and investment treaty negotiations with China. The company has spent $8.84 million on lobbying so far this year, making it one of the top influence spenders in Washington. In years past, records show, Exxon's advocates have lobbied State on issues involving Russian sanctions and the Keystone XL pipeline, which was to be routed from Canada through the American Midwest. Dennis McCuistion, executive director of the University of Texas, Dallas' Institute for Excellence in Corporate Governance, said a Tillerson appointment would bring with it worldwide contacts linked to Exxon that could open doors around the world along with questions about conflicts of interest. "When you start looking at a conflict, whether or not something is done for the benefit of business versus the benefit of international relations, that question is going to come up," McCuistion said. "The idea that everything pro-business is appropriate for intergovernmental relationships is just not appropriate, in my opinion." On a call today, Trump transition officials warned reporters not to ascribe certain administration jobs to individuals Trump was meeting. Jason Miller, a transition spokesman, said the president-elect is continuing to go through the process of picking his secretary of State and make sure he gets this pick right. "And as I said before, not only is it a matter of making sure that someone who will be able to articulate the administration's worldview on the international stage but also someone with whom the president was able to clearly connect with and have the same vision for what we're trying to do for our country," Miller said. "Someone who is very good at making deals and someone who's going to represent us proudly." McCuistion said that while he would personally support a Tillerson appointment, questions about conflicts of interest — whether real or perceived — have fueled his skepticism. "That's why I am, let's just say, skeptical someone like Rex Tillerson would get the job," he said. "But under Donald Trump, anything is possible, isn't it?" A source close to the transition effort also questioned such a pick, simply saying, "I'm not too worried about Rex getting a job." An Exxon Mobil spokesman declined to comment for this story. Tillerson, 64, himself is familiar with foreign affairs. The Wichita Falls, Texas, native joined Exxon in 1975 as a production engineer and rose through the corporate ranks. By 1998, he was in charge of Exxon's holdings in Russia and the Caspian Sea, and in 2013, he was given the Order of Friendship by Russian President Vladimir Putin. Tillerson also is a trustee of the Center for Strategic and International Studies and is a member of influential trade associations such as the Business Roundtable and American Petroleum Institute, sitting on its executive committee. Earning compensation of nearly $27.3 million last year, he has been Exxon's CEO since 2006 and will soon reach the company's mandatory retirement age of 65. Tillerson, though a reliable Republican donor, has differed with Trump and many GOP lawmakers when it comes to climate change. "We share the view that the risks of climate change are real and require serious action," Tillerson said at the Oil & Money conference in London in October, according to the Financial Times. Exxon has also supported a revenue-neutral carbon tax as well as last year's international climate agreement reached in Paris, which it reiterated in a tweet a few days after Trump won election as U.S. president. "The Paris agreement is an important step forward by governments in addressing the serious risks of #ClimateChange," said Suzanne McCarron, Exxon's vice president of public and government affairs. Tillerson would have a hand in the Trump administration's climate policy as secretary of State and could find himself in disagreement with the president. Trump has pledged to withdraw the United States from the Paris Agreement and roll back environmental regulations and has questioned the science behind climate change. Nevertheless, Tillerson is not considered a champion by environmentalists. In fact, many activists and their Democratic allies would relish the chance to question Tillerson about Exxon's alleged covering up of climate science — now subject to battles in court and on Capitol Hill — at his confirmation hearing if he is picked for a Trump Cabinet position. "Covering up climate science and deceiving investors qualifies you for federal investigation, not federal office. An oil baron as Secretary of State would do enormous damage," said May Boeve, 350.org's executive director, in a statement today, adding that Tillerson "could deeply disrupt international efforts towards climate action" as Trump's secretary of State. 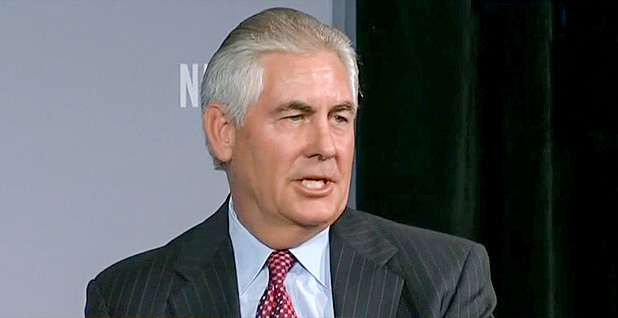 Michael MacCracken, chief scientist for climate change programs at the Climate Institute, interacted with Tillerson at a Exxon Mobil shareholders' meeting in Dallas in May, where they talked climate change. "He agrees that it is human-induced, though not nearly as serious. He believes we can adapt," MacCracken told E&E News. "He is basically a technological optimist." MacCracken cited Exxon's support of a carbon tax but said the company has not put forth a substantial push behind that issue. He questioned Exxon's and Tillerson's efforts in combating climate change. "What do you do with sea-level rise of a meter in Houston or in Florida?" MacCracken said. "It's just not clear he appreciates the seriousness of the issue." The University of Texas' McCuistion said past controversies over Exxon's handling of climate science are bound to pose challenges for a Tillerson nomination. "If Rex Tillerson gets the job, there will be questions from a big part of the international community about whether someone, regardless of how good a guy he is, can be objective when it comes to the issues of climate change, global warming, et cetera," he said. "Can he be objective or perceived as objective? That's the question."